When it comes to summer entertaining, there’s nothing I love more than bringing together a bunch of good friends, whipping up a bunch of easy tapas recipes, and entertaining on my patio. It’s the easiest, most relaxed way to throw a party, and let’s face it: summertime just calls for relaxed, chilled out fun. I’m SO inspired by super-awesome summertime tapas parties in fact, that we put together a tapas party serving set on the website. Now everyone can enjoy one of my favorite summertime activities. Now, unless you’ve been to Spain or to an awesome Spanish restaurant (or you watch a lot of the Food Network) you’re probably wondering: What are tapas and why are they awesome? Simply put, tapas are small bites of food, often served family style, meant to be shared, and straight-up perfect with a cold, refreshing drink. They’re often foods that taste good hot, room temperature or even cold, so you can serve and forget all about them while you mingle and have a good time. Plus, they’re tops with a glass of sangria, a cold beer, a glass of wine, or even a nice summery cocktail. And since they can be eaten with fingers, they’re pretty ideal for a party where you want to encourage mingling. So on to the cooking! 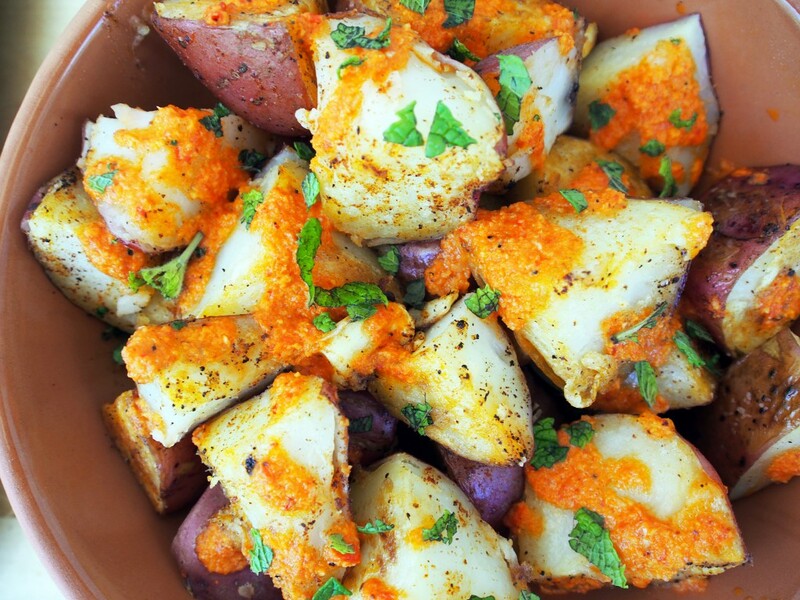 This recipe for patatas bravas (sometimes called papas bravas) is one of my favorite tapas recipes ever. It’s a little nontraditional, but I’m totally fine with this spicy, flavorful update on a classic. Plus, since we’re sauteing the potatoes rather than deep frying, it’s a little lighter. This hearty vegetarian tapas recipe (actually it’s a vegan recipe AND a Gluten Free Recipe) is one that will stun both meat eaters and herbivores with its simplicity and seriously bold, punchy flavors. So get your taste buds ready, folks. 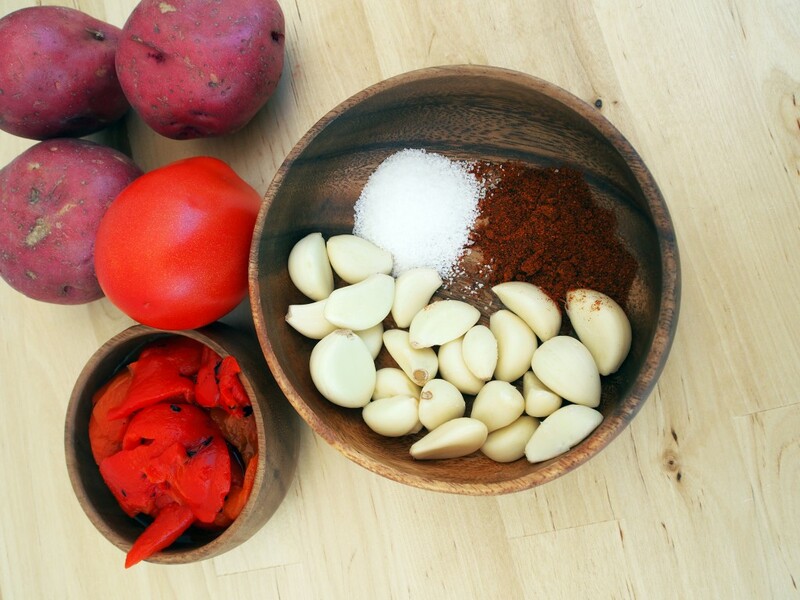 Let’s make some potatoes that’ll put a tapas restaurant to shame. Spoiler alert: they’re really easy to make. This recipe serves four easily, most likely 6. Of course, it makes for fantastic leftovers as well. Reheat in the oven with a fried egg for the best hangover breakfast ever! Pre-Cook the potatoes: Cut the potatoes into bite-sized pieces and place in a large pot of salted water. Bring to a boil and cook until cooked through. When potatoes are fork-tender, remove from heat, drain and allow to cool. Leave them alone while you make the sauce. Make the Sauce: If you like the taste of raw garlic, keep the cloves raw. If not, saute the garlic cloves in the olive oil over medium low heat until tender. Set garlic and oil aside. Add tomatoes (chopped or crushed,) roasted peppers, salt, spices and vinegar to the carafe of your blender. Pulse to blend. Add garlic and oil and blend sauce until creamy. Taste and adjust seasoning if necessary. Sometimes I add a little lemon juice. Saute the potatoes: Heat oil and sliced garlic cloves in a pan and bring to medium high heat, stirring constantly so garlic doesn’t burn. When garlic is golden-brown and fragrant, remove it from the pan with a slotted spoon. Set on a paper towel and resist the urge to snack on the garlic chips. Add the paprika, garlic powder and salt to a small bowl. Toss to combine, then add the potatoes. Toss again, then put directly into the hot pan of oil. Saute until the outsides of the potatoes are golden brown and crisp and the insides are warm, moving the potatoes occasionally so they don’t burn. 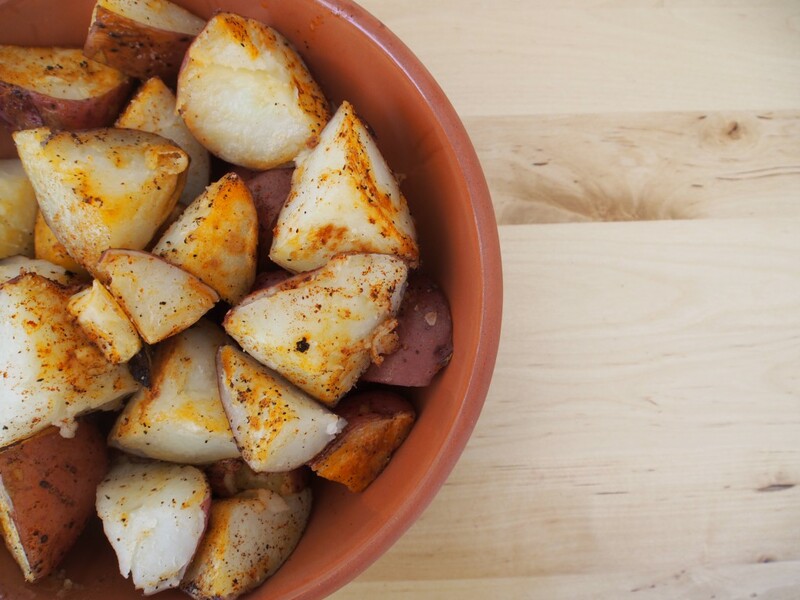 Plate your food: Pour the potatoes into a couple of terracotta dishes (they’ll hold heat so the potatoes don’t get cold). Drizzle with that red-pepper/tomato sauce and garnish with parsley leaves. There: Told you it was easy. This recipe fits pretty perfectly in the large terracotta dish included in our Tapas for Two Tasting Set. Sure, it may overflow a little, but we love that bountiful look. 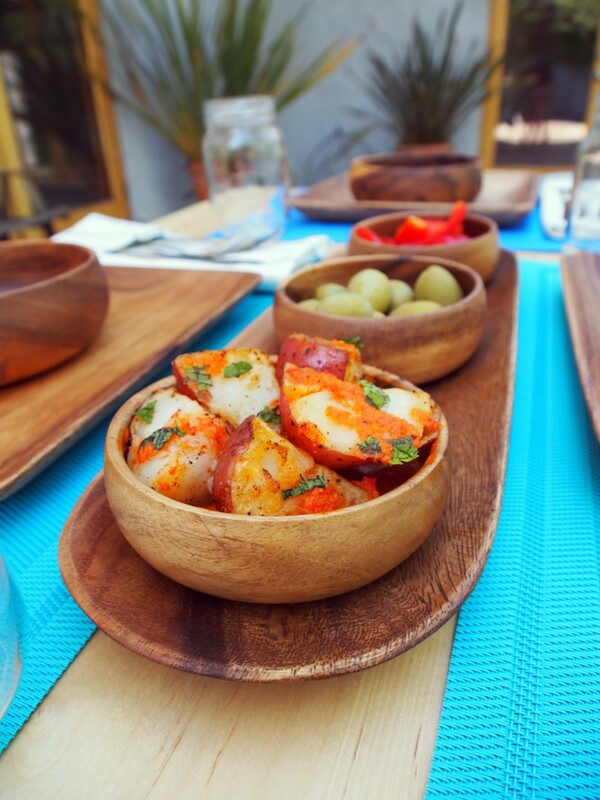 Let us know in the comments: What’s your favorite tapas dish? What’s your favorite finger food? 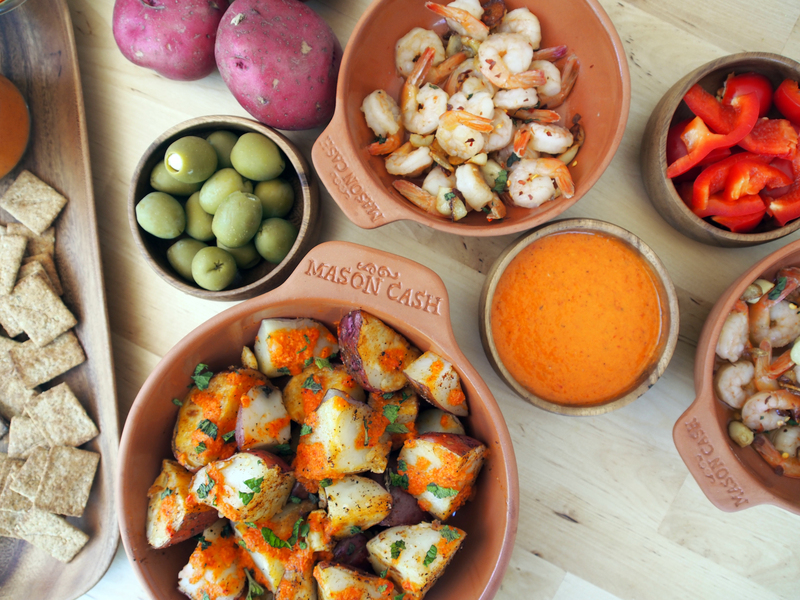 What’s your fave way to serve potatoes? Also share your photos with us on Instagram and Facebook with the hashtag #PacificMerchants. We’ll repost/share our favorites. May the tapas be with you. This entry was posted on Thursday, May 1st, 2014 at 4:06 pm and is filed under Gift Guide, holiday, Recipes. You can follow any responses to this entry through the RSS 2.0 feed. Both comments and pings are currently closed.